A photo shot in 2013 of the site purchased by Mr. Eichner for a condo development. Ian Bruce Eichner’s comeback is gathering steam. The New York developer, who suffered high-profile failures in two real estate busts, late last week secured $420 million in financing for a nearly 800-foot condo tower just south of Madison Square Park in Manhattan, according to multiple people familiar with the financing. 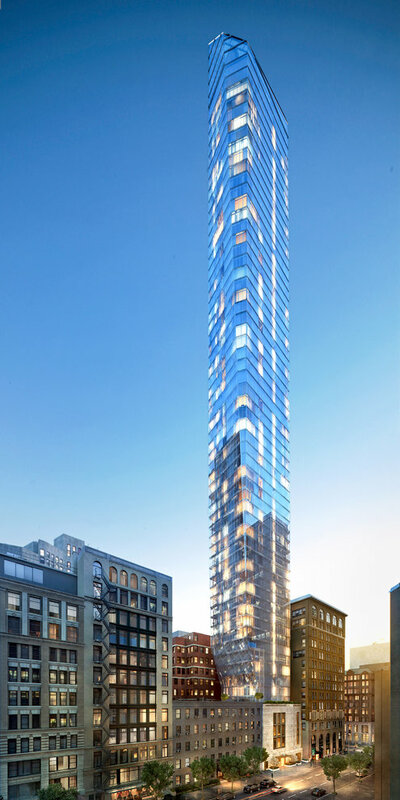 The commitments – including more than $340 million from a Goldman Sachs Group debt fund and more than $80 million in preferred equity from Dune Real Estate Partners and Fortress Investment Group — give the planned glassy tower the funding to be completed, these people said. The deal marks a remarkable turn for Mr. Eichner, who became an early face of the last real estate bust when his planned $4 billion Cosmopolitan of Las Vegas resort casino stalled amid a credit crunch. After he was unable to refinance a loan, he surrendered the development to Deutsche Bank, which completed it and sold it to Blackstone Group earlier this year. During the real estate bust of the 1990s, he defaulted on a loan financing a flashy office tower. Because of his history some lenders have avoided Mr. Eichner. Still, Mr. Eichner’s backers point out that he has had some big successes in his career, including a 530-unit condo project tower in South Beach. Some lenders view him as a skilled builder who has been the victim of poor timing. The deal for the tower at 45 East 22nd Street is the latest luxury condo tower to get financed in New York, joining a string of towers that have been selling units for well over $3,000 per square foot, a sum considered eye-popping just a few years ago. An influx of foreign buyers and growing ranks of the wealthy have helped propel the market, which, in turn, has pushed up the price of land throughout Manhattan. 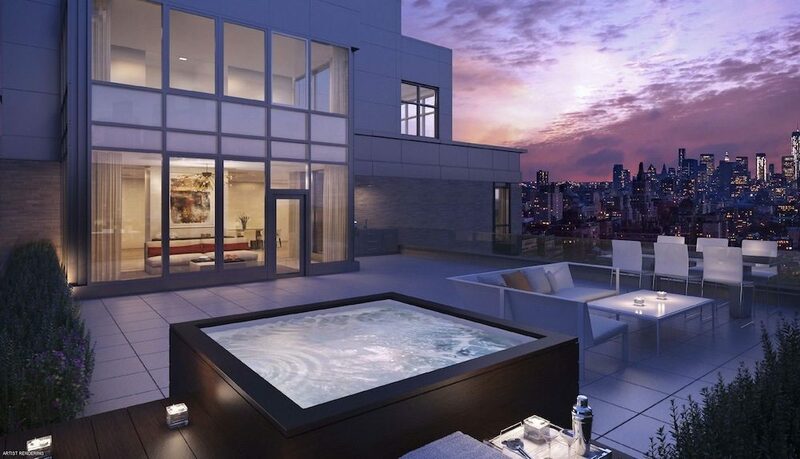 Of course, many wonder how much depth there is to the pool of super-wealthy condo buyers. A slowdown in the sales at Gary Barnett’s One57 turned heads when it was reported in last month. Mr. Eichner’s project, however, has some advantages. It has a lower land cost than many projects being planned today, given that he struck his deals to buy the land well over a year ago, when land was cheaper. In addition, few other large developments sit near Madison Square Park. Construction has already begun, and the project even has a preliminary website. Sales are expected to begin later this fall. The funding came together more than a year after Mr. Eichner bought the land. The backers all have extensive New York condo experience. Goldman, for instance, was the main investor in the successful 15 Central Park West condo project through a private equity fund, while Dune is an investor in 56 Leonard St. in Tribeca, which is nearly sold out. hood not yet overrun by luxury condominiums but very much in vogue with globe-trotters wishing to acquire a residence with the caliber of amenities and views only a skyscraper can reliably deliver, 45 East 22nd Street is about to assert itself just a stone’s throw from Madison Square Park’s only other modern glass-skinned tower, One Madison.The 65-story skyscraper will top off at 777 feet, besting One Madison by about 150 feet. But unlike other towers going up around town, the floor plate for this one will expand as the building rises. At ground level, the site measures 75 feet wide, but the glass tower incorporates a subtle 17-foot cantilever above its low-rise neighbor to the west, which allows the building to grow progressively wider as it rises, insuring that every apartment is slightly different in size. It culminates in a 7,000-square-foot duplex penthouse on the 64th and 65th floor, with the top floor measuring 125 feet wide. Paul Katz, a principal of Kohn Pedersen Fox Associates, which designed the building and is the firm behind the master plan for Hudson Yards, described the tower as “a flaring, Brancusi-esque sculptural form.” Construction at the site, cobbled together from an assemblage of air rights and demolitions on East 22nd Street, is expected to start in February. A sales office opens this month, and the anticipated move-in date for the first wave of buyers of the 83 units, which will range from $2.5 million to $42.5 million, is December 2016. 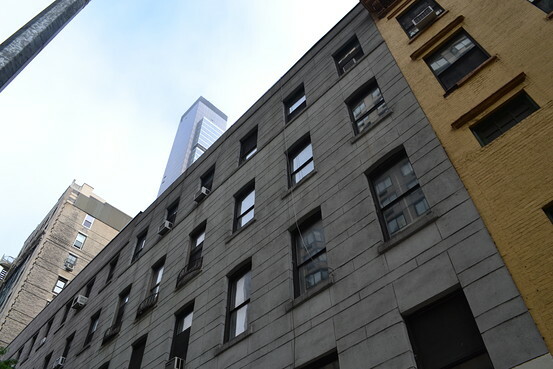 A spokesman for One Madison said that the arrival of 45 East 22nd Street poses no serious danger to the ballyhooed views from the incumbent tower where Rupert Murdoch secured the triplex penthouse and a full-floor condo beneath it. Only lower-floor views in the direction of Stuyvesant Town are potentially affected, the spokesman said. The new tower’s developer, the Continuum Company’s indefatigable Ian Bruce Eichner, has a complicated history with One Madison. He tried unsuccessfully to buy One Madison in 2010, after the building ran into financial trouble and was hobbled by debt and multiple lawsuits; the Related Companies, the CIM Group and the HFZ Capital Group later emerged as the new owners. This time, Mr. Eichner did his due diligence in obtaining financing for his multimillion-dollar project at 45 East 22nd Street: Goldman Sachs provided a $340 million construction loan, with an additional $80 million from the Fortress Investment Group and Dune Real Estate Partners. In a recent interview at the sales office at 315 Park Avenue South, Mr. Eichner described the financing, architectural plan, interior design and amenity packages as “fully baked. The only things we haven’t picked out and bought yet are the mailboxes.” Mr. Eichner, whose previous projects include One Broadway Place, CitySpire and the Continuum South Beach, says he feels the opportunity to build a significant tower in an iconic Manhattan neighborhood is a one-off. “Look, I’m a senior citizen, and I don’t see myself ever getting to do anything like this again in my lifetime,” he said. The glass tower will have what KPF describes as a “contextually appropriate” rusticated granite base reminiscent of a grand manor house, carved from the same type of stone used for the historic United States Custom House in downtown Manhattan. There will be no more than two apartments per floor, and residences will begin on the equivalent of the ninth floor, with full-floor units from the 55th floor. Lower floors will be dedicated to building amenities. The views from the upper floors will include the Hudson and East Rivers, the Chrysler and Empire State Buildings and Gramercy Park. But even buyers of the smaller apartments on lower floors will have access to the building’s so-called Upper Club on the 54th floor for private dining and entertaining. One-bedrooms will average 1,074 square feet and cost $2.5 million. The two variants of two-bedroom apartments will cost $4.49 million for 1,497 square feet and $4.87 million for 1,525 square feet. 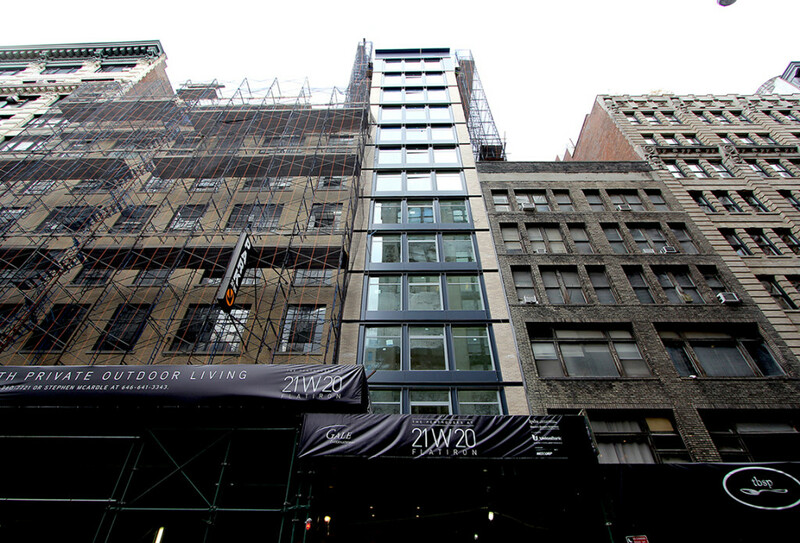 Three-bedrooms will start at $6.04 million for 2,153 square feet. None of the apartments will have private outdoor space, but there will be a terrace on the fifth floor, which will also house a lounge, billiards room and card room. The fourth floor will have a fitness center, and there will be a children’s playroom, golf simulator, yoga studio and half-court basketball facility on the second floor. The interior design is by the Martin Brudnizki Design Studio of New York and London. According to Mr. Brudnizki, buyers will be able to select from three finishes for the floors and kitchen cabinetry, and all interior corners will be rounded: “The softness is in the details, and every apartment will have a personality,” he said. The Corcoran Sunshine Marketing Group is handling the sales. A Morris Adjmi-designed project in the Flatiron District was approved by the Landmarks Preservation Commission earlier this week, paving the way for further city approval, YIMBY reports. The project is located on a through-block site and will restore existing buildings at 40-42 West 18th Street and 45 West 17th Street, and construct a new building at 38 West 18th Street and 41-43 West 17th Street. Back in September, the LPC rejected the project, saying that Adjmi's then-designs did not fit with the historic character of the Ladies Mile Historic District. Back then, the 18th Street building would have been constructed from concrete and the 17th Street building would have been 18 stories tall. Now, the material will be buff brick and the height will be reduced by 19 feet and will be 16 stories. LPC chair Meenakshi Srinivasan praised the changes, which she said "fit in quite well" with the rest of the neighborhood. Other commissioners gushed over the new designs, calling them "contextual," "extraordinary," and "a total home run." Otherwise, much of the original plan has been retained. Like the old designs, there will be differing exteriors on 18th and 17th, a three-story central area shared by the two buildings, and an interesting facade design, including a metal mesh that will simulate historical brickwork. The project will now go before the Bureau of Standards and Appeals to deal with the shared central area and the project's setbacks. 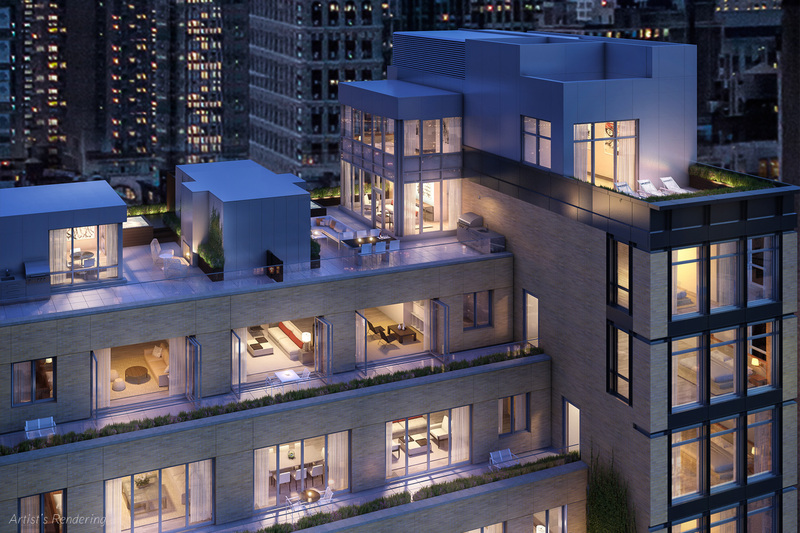 Two penthouse units (yes, two) remain at Gale International‘s boutique condominium development 21W20. 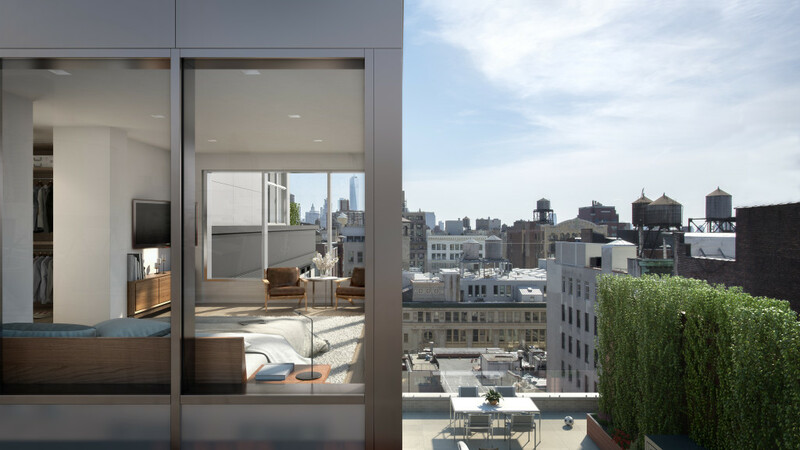 The 15-story mid-rise is Gale’s first foray into the Manhattan market and has already placed 11 of the building’s 13 full-floor homes into contract at an average price of $2,528 per square foot. Slated for occupancy by year’s end, the project’s construction netting has finally come down and the finishing touches are now being applied to the lobby. More info, images and video in the post here.